I remember thinking that it would be nice to learn how to bake fresh bread for sandwiches and toast. And then I saw the other things identified as breads… stuffed breads, rolled breads, cinnamon rolls … four hundred pages of nothing but yum. Yeasted tasties cover the spectrum of sweet breakfast goods to savory dinner-worthy loaves. Ptooey on white bread for slicing … I chose to begin my foray into bread baking with the Reuben bread and it’s been in the repertoire ever since. 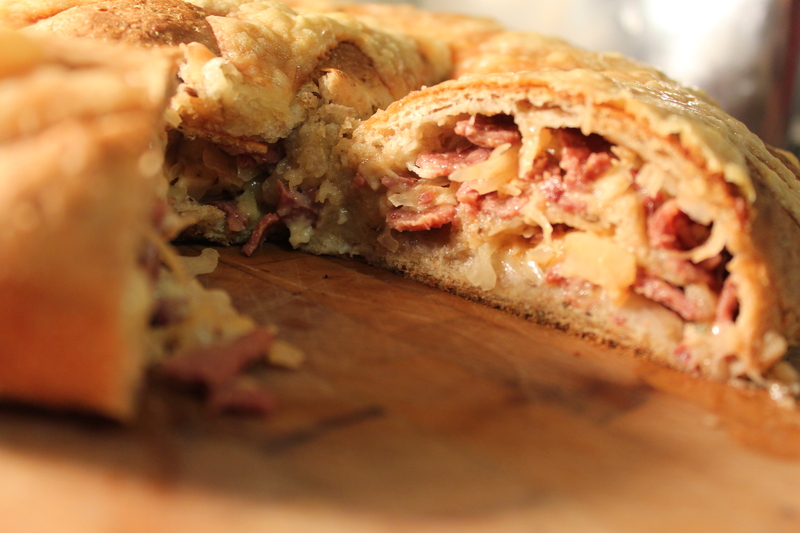 Best Reuben bread memory. A sibling beer run to stock up for Christmas festivities a few years back was a trip to Montreal for a weekend of good food, sibling camaraderie, and beer, lots of beer. Hey, yeast goes well with hops, too! 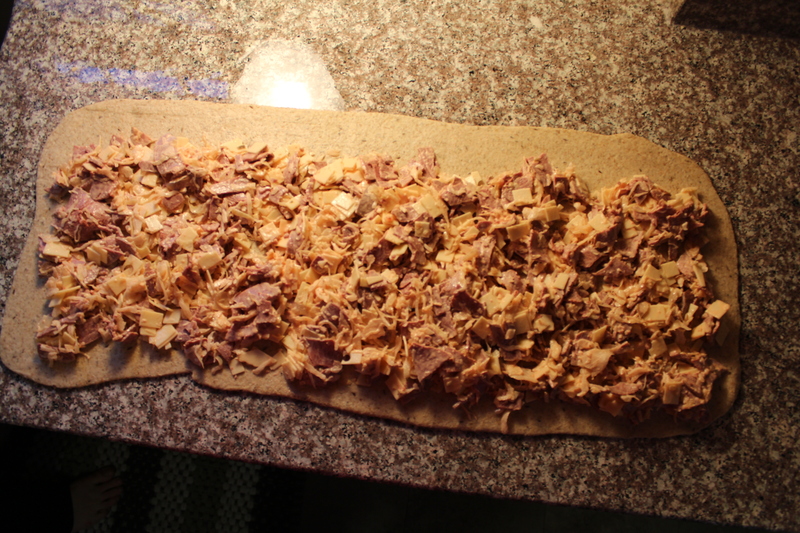 I had baked the Reuben bread and matzoh crunch (a terrific treat I’ll post one day) to share for the ride up. Happy with a full belly, I commandeered the back bench of the rental van and missed the terror of the Upstate New York portion of the ride when Francine mistook an off-ramp for the through lane and almost careened us off the snowy highway in a most spectacular (in the bad way) fashion. Fortunately, her stellar driving skills (no doubt fueled by the Reuben bread and screaming passengers) got us all safely back on the road and to our destination in one piece. They did wake me, none the wiser of my near-death experience, for a photo by the “Bienvenue au Québec” sign. I’m the one without the look of terror on my face. The two other backseat riders, Mitchell and Monica – to this day – are a tad bitter that I didn’t have to experience the years off one’s life that occurred that night. Ah, well… This is the stuff that glues a family together, you know. The weekend was quick but the memories are fond: forced march through the sub-zero temperatures to “tour the city;” beers and a loose interpretation of nachos at Le Cheval Blanc where an insistent homeless man drew a picture of our group, penned an unreadable poem, and presented to us with a demand for money (which we paid); poutine and every other tasty treat Montreal has to offer; and scintillating conversation regarding monetary conversion. 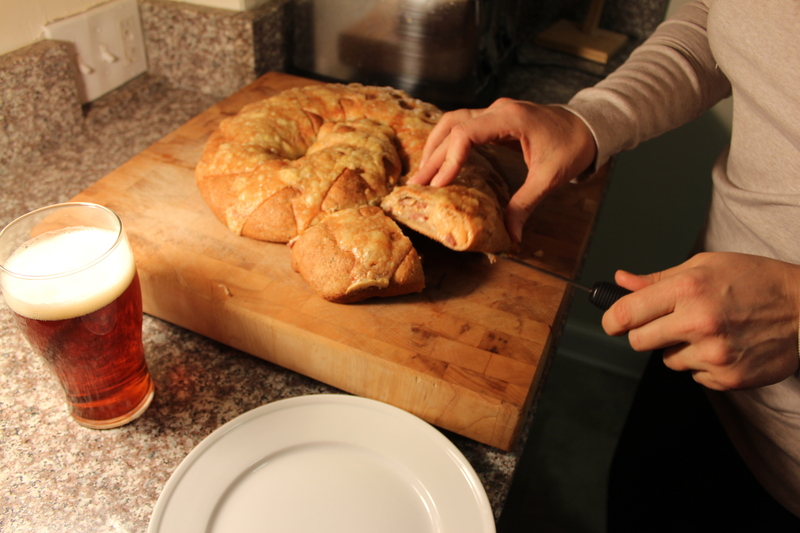 To this day, every time I bake Reuben bread, I am transported back. Thinking that it’s time for another sibling beer run soon. With all of the additions to our siblingness, we’d need to move up to a party bus (bonus here: Francine doesn’t have her commercial license so we’ll be allowed back on the NY State Thruway). 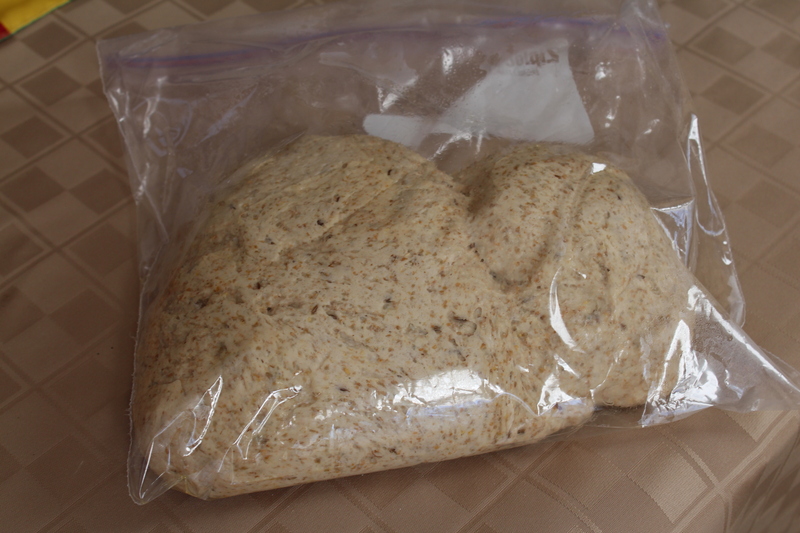 It’s a yeasted bread so we start with … yeast! Give it a few minutes to bubble up … make sure it’s alive and well. 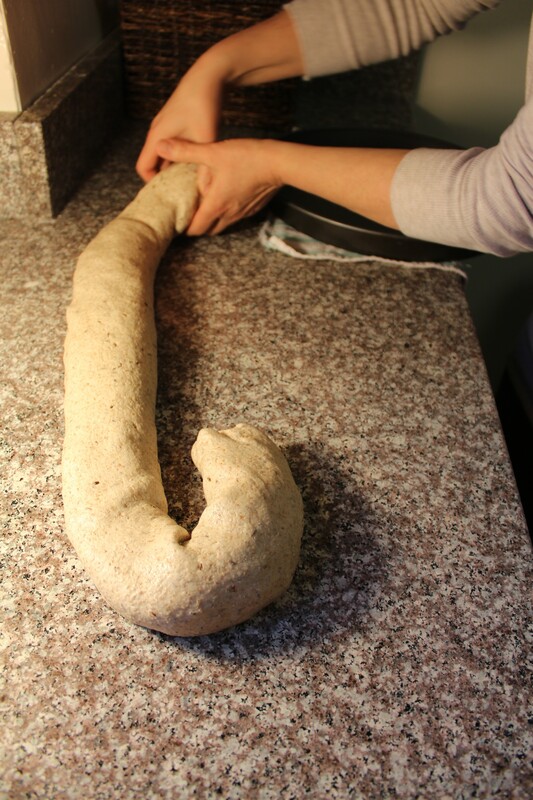 While your yeast is waking up in the water, measure out the rest of the dough ingredients. I love caraway seeds in this recipe. If you aren’t a fan, you can leave them out. May I gently suggest you at least try them the first time; they do add that something special to the bread. Be sure to use a good hearty rye flour (on the left; all purpose white is on the right); it gives the most flavor and adds to the hearty texture which you need to keep the filling in check. And don’t squinch your face at the vegetable shortening. To quote Julia, “Everything in moderation!” It’s got it’s place in the modern pantry. In this loaf it keep the bread supple (for lack of a better word, but you know what I mean … not too brittle which would let the filling ooze out). This photo serves no purpose other than to remind you to add the honey and show how cool Stephanie’s camera is … even I can get a good photo every once in a while. 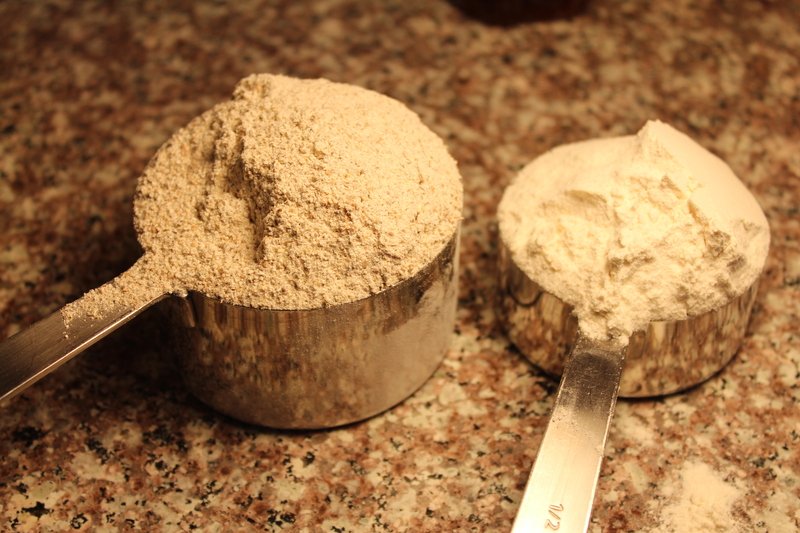 Once the dough ingredients are combined in the bowl (top), knead about 8 minutes (bottom), adding additional flour by bits as necessary to keep it from sticking. You are not, however, looking for a dry ball of dough. It should feel like the proverbial baby’s bottom. Well, not proverbial, but oft used term, eh? Usually, I let the dough rise in the bowl which has been very lightly oiled and covered with plastic wrap. However (and bonus for it’s hearty adaptability), we went out for a few hours mid-rise so I put the dough into an oiled plastic zipper bag (top) to rise in the fridge. When we got home, I put it back on the counter (bottom) – thinking it would take about an hour to come to room temp – while I got the filling ready. The best laid plans … the house was cold and it was looking like dinner may be later than the ravenous crowd was willing to accept so I employed my very unorthod0ox (yet very effective for HEARTY doughs) heating-pad-on-low method to warm the dough to pliable room temperature in the time I had hoped for – about one hour from fridge to ready to roll, keeping a big old hairy eyeball on it the entire time. Pat the dough into a rectangle and roll out on your meticulously clean and lightly oiled countertop. The dough should measure 10(ish) by 25(ish). Gather your filling ingredients. Make sure that the sauerkraut has completely drained. You should be able to press on it and have no liquid running out. Otherwise, you’ll have a wet loaf which is really not what you’re going for here. Toss the filling ingredients to combine. Taste! If you’d like a bit more mustard or dressing, now’s the time to add though I’d be sparing to keep the moisture from taking over and leaving you with a wet final loaf. Bletch… that’s a textural curve ball that you really don’t want. Have extra for dipping of you’re that much of a fan. 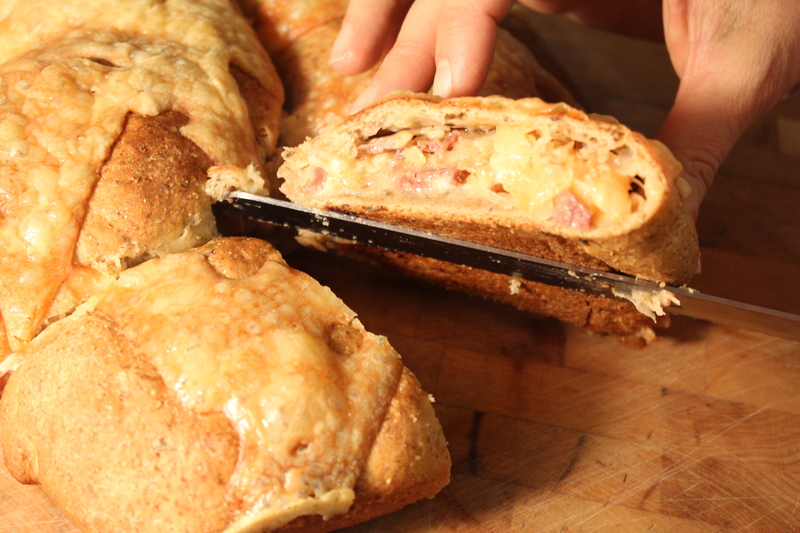 Put the filling onto the dough and using your hands (best utensils ever!) 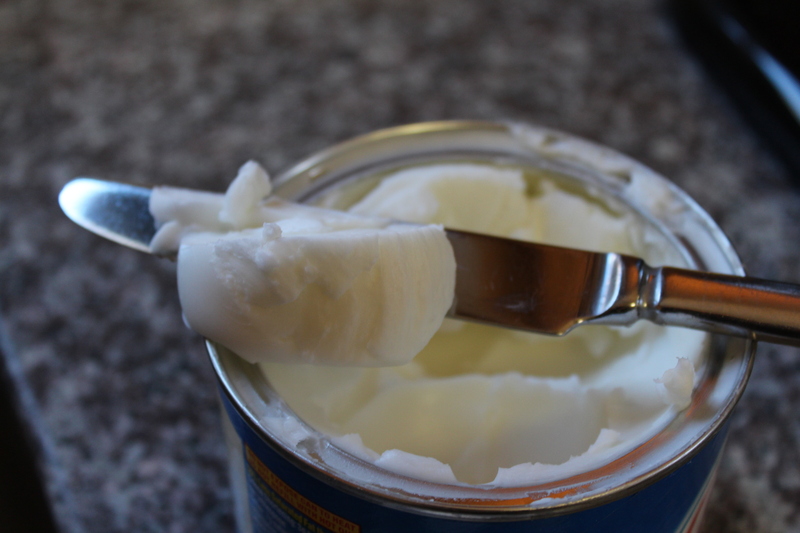 spread evenly, leaving the top edge for sealing. 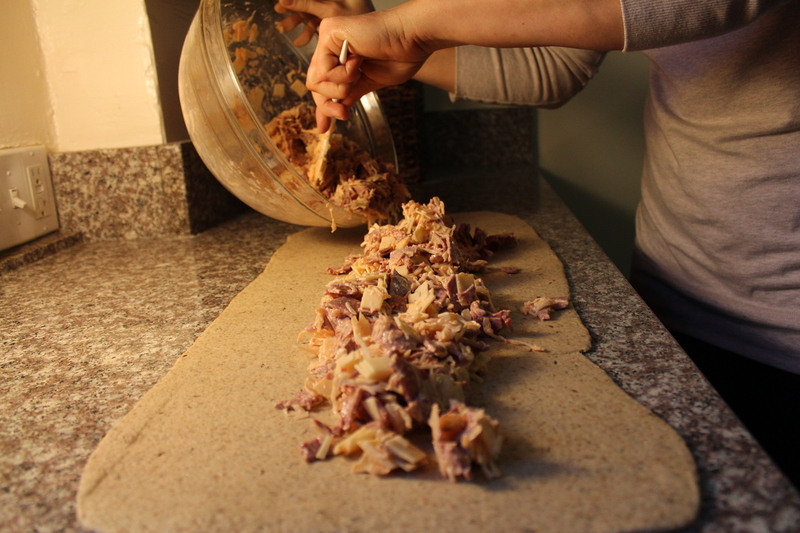 Starting at the bottom, roll the dough into a tight log. Be swift. As a lefty, I go left-to-right, quickly getting the roll going. Do not be meek; your hearty dough can take it. Show that dough who’s boss! Pinch seams and end to seal. Now rassle that titanoboa into a coil for a 45 minute rest in the pan, covered with a kitchen towel. I preheat the oven as soon as I cover the dough for it’s final rest. You need to give it at least 30 minutes to preheat. 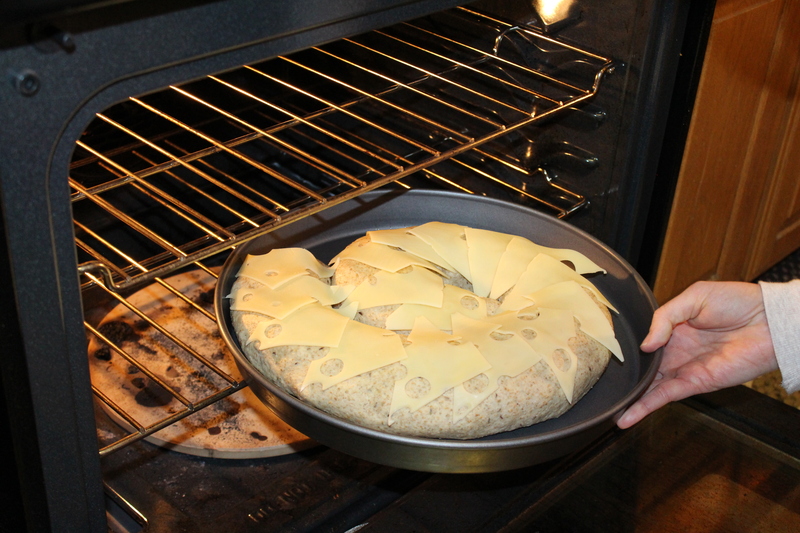 Just before baking, cover the dough with the remaining 1/3 of the Swiss cheese. Bake at 375 for about 35-40 minutes. As an aside, yes, my oven could probably use a cleaning but what you see down on the bottom is my pizza stone, well loved and well seasoned for the next batch. Never wash the stone! When the Reuben bread is golden brown, remove it from the oven and let it sit at least 20 minutes to allow the innards time to firm up and to keep you from burning your mouth which would diminish your ability to enjoy a properly cooled wedge or three of the bread. Sip a nice cold beer while you wait. And here you go! Slice into wedges and serve. Tasty deliciousness. And a final artsy shot … my favorite! 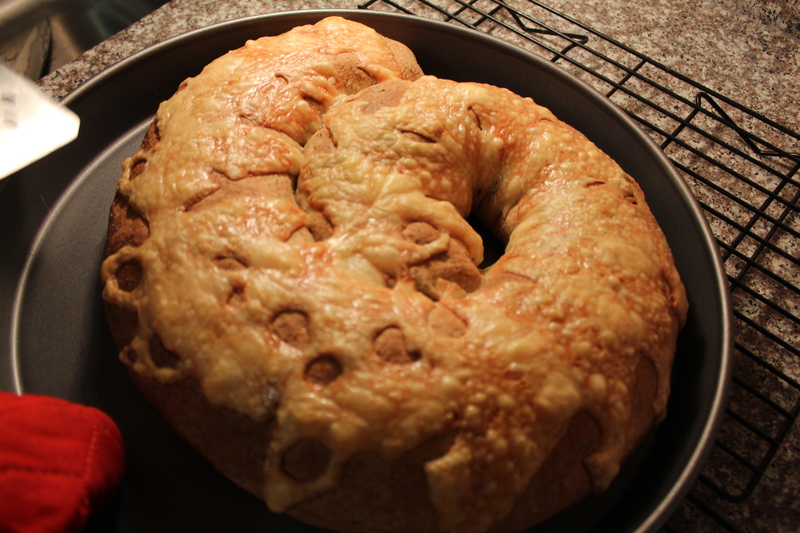 This truly is an easy bread to make – it’s the one I learned on. I hope you’ll give it a try. Enjoy! 1. 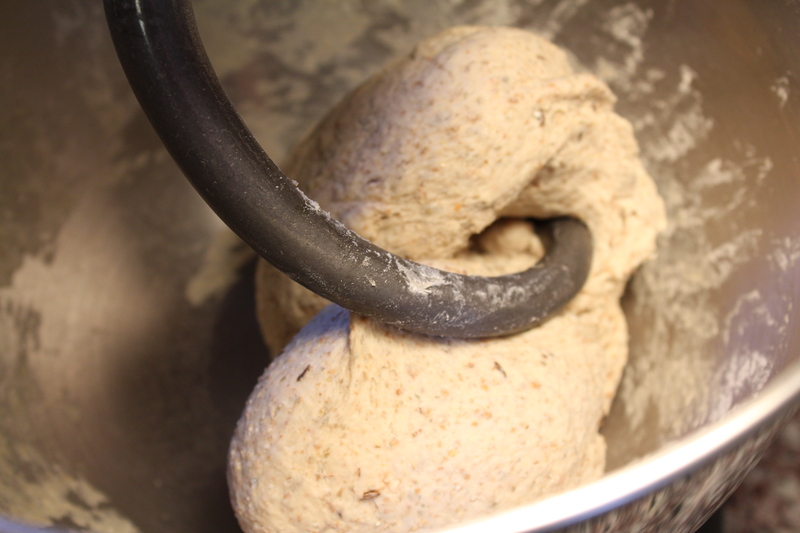 Begin the bread by softening the yeast in the water in the bowl of a mixer with the hook attachment. Give the yeast about 5 minutes to bubble up (to know it’s working). 2. 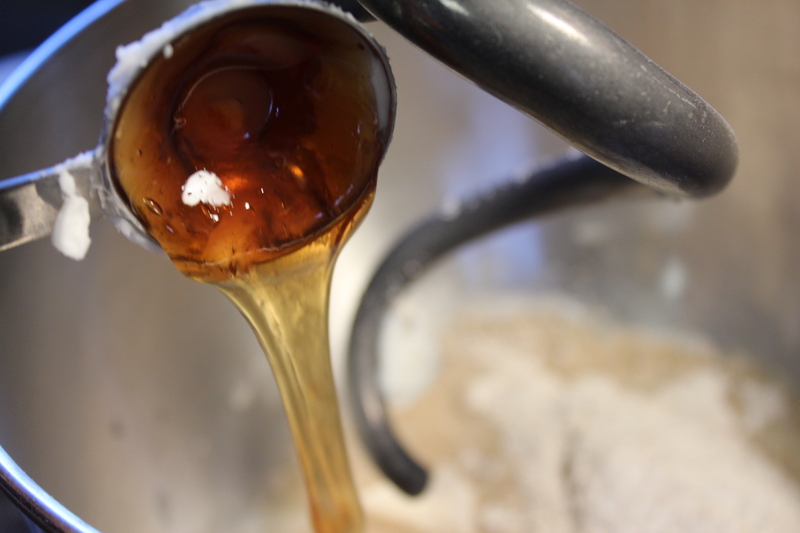 Add the shortening, rye flour, 1 cup of the AP flour, salt, honey, and caraway seeds. Beat on low speed for about 2 minutes. 3. Gradually add more of the remaining AP flour, 1/4 cup at a time, until the dough forms a mass and begins to pull away from the side of the bowl. 4. 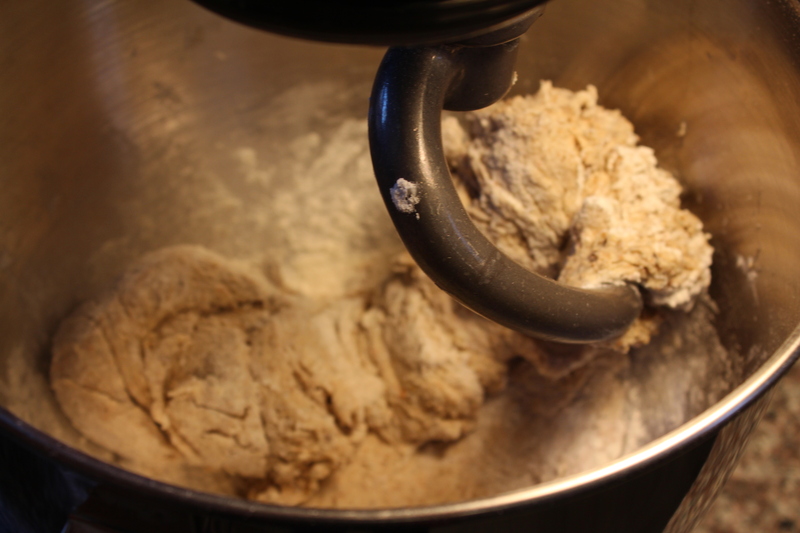 Knead on low speed, adding more flour a little at a time as needed to prevent sticking, for about 8 minutes. 5. Add about 1 tsp of neutral oil to the bowl and roll the dough around to coat. Cover with plastic wrap and let rise about one hour or until double in size. 6. 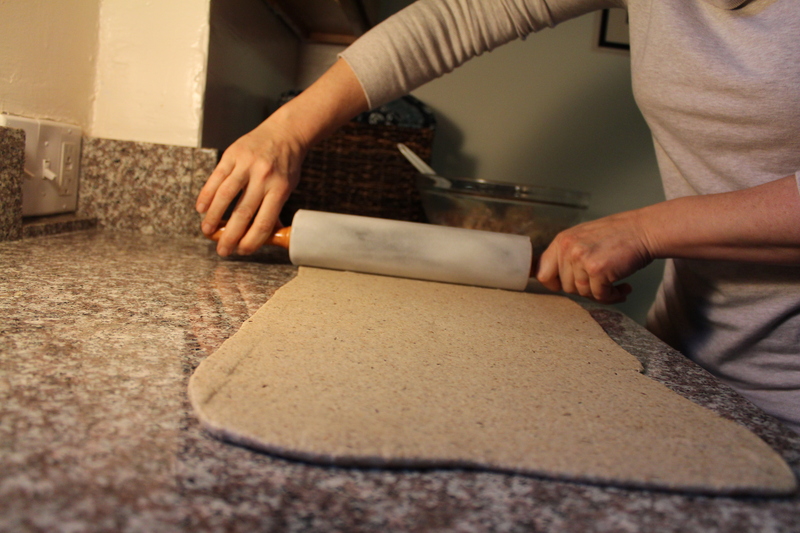 Turn the dough out onto a lightly oiled work surface and roll out into a 10 x 25-inch rectangle. 7. 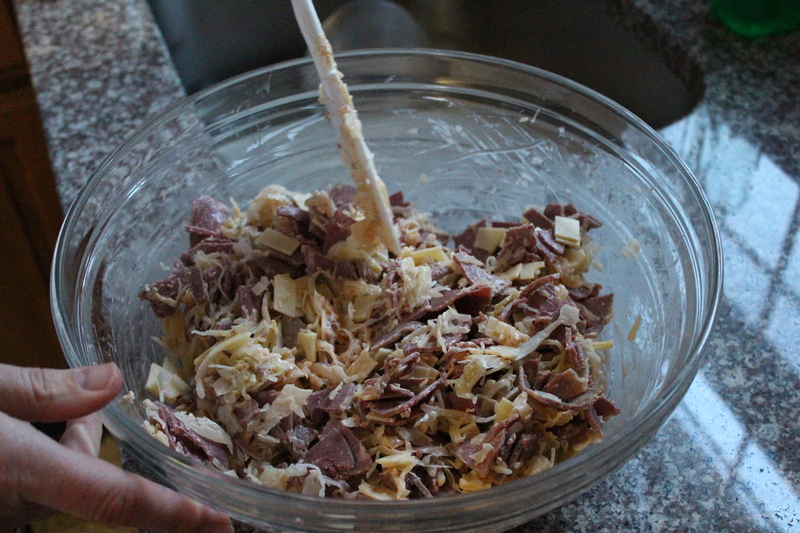 Make the filling by combining the Thousand Island dressing, mustard, drained sauerkraut, corned beef and 2/3 of the Swiss cheese. 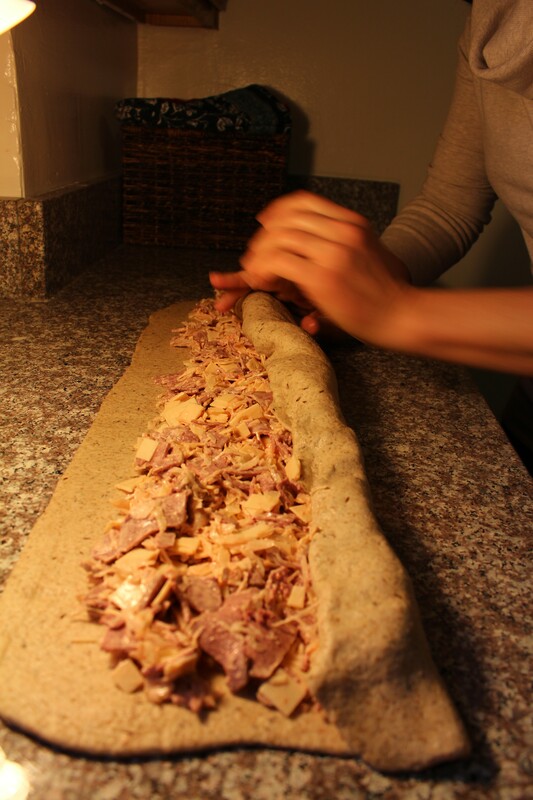 Spread the mixture evenly on the dough leaving a 1 inch border along the top 25-inch edge. Starting from the bottom 25-inch edge, roll tightly toward the top. Pinch the seam together and tuck each end under. Coil the dough loosely and put onto a well-greased (or nonstick) pan. Cover with a towel and let rise for about 45 minutes or until almost double in size. 8. Half an hour before the end of rising, preheat the oven to 375 degrees F.
9. 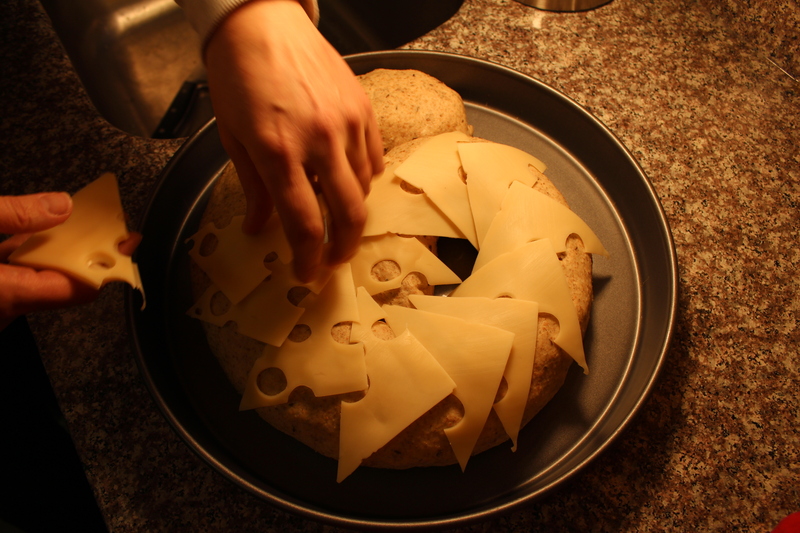 Just before baking, top the coil with the remaining Swiss cheese. I cut into triangles and lay out along the length though it’s just as easy to sprinkle on shredded Swiss if that’s what you are using. 10. Bake for 35 to 40 minutes or until golden brown. 11. Remove from the pan and let cool on a rack for at least 20 minutes before serving in wedges. 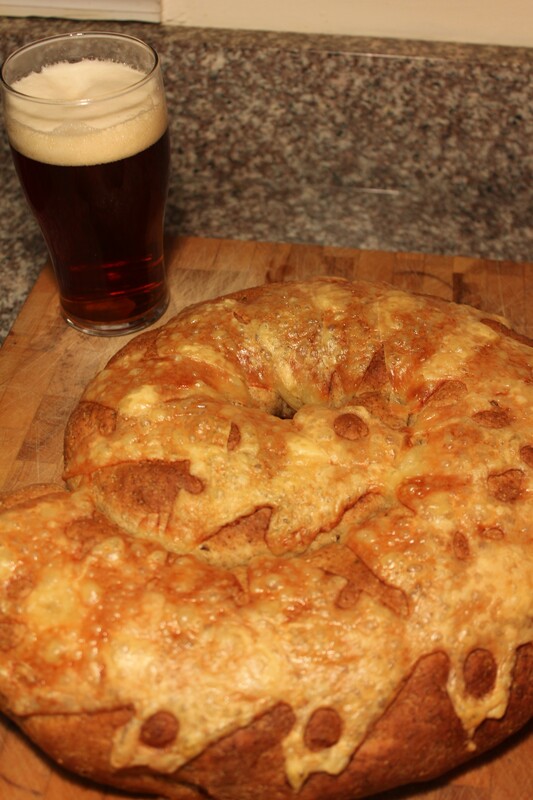 This entry was posted in Appetizer, Bread, Main Dish, Sandwich, Snack and tagged 1000 Island, beer, corned beef, game day meal, great with beer, King Arthur flour, Octoberfest, Oktoberfest, party, party food, Picnic, Reuben, rye bread, Sandwich, sauerkraut, swiss cheese. Bookmark the permalink. I’m not a big fan of Rueben sandwiches (maybe I just never had a good one??) 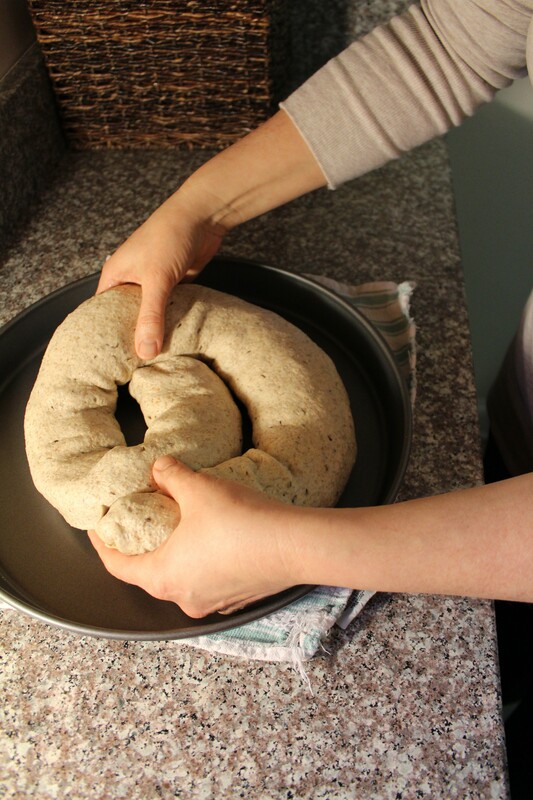 Would this dough (minus the caraway seeds) work for making a pizza roll or would pizza fillings be too oozy? Hi Kat. I’d stick with a traditional pizza dough for a pizza roll. This dough really does taste like rye bread. You’d only really have an ooze issue, I think, if you added too much sauce or too many wet ingredients. I’ll add that to my “must try” list. Thank you for the great idea! Thank you! Anytime … and you’ll be glad to know that next is Zhudra Lakway (once I learn how to spell it). With French fries.